How often do you contemplate the day as a whole entity? We often think about the ‘work day’ or the morning or the evening – compartmentalising and planning activities that will fit into these arbitrary time-frames. But what if we were to pull back slightly and consider the day as a whole – a complete cycle of 24 wonderful, potential hours in which to live and enjoy to their fullest? I’ve done the ‘Ideal Day’ exercise a few times over the years, and I always find it a useful way to nut out exactly what I want to be doing with my time. If you’ve never done it before, it’s very simple. Sit down with some sort of recording device (journal, laptop, tab – whatever works for you) and write down – in detail – what you would do in your Ideal Day – from when and how you wake up to when and how you go to sleep. Now, I’ve seen a lot of people do this as a bit of a ‘pie in the sky’ exercise – basically dreaming of what their Ideal Day could be if there were no limitations or responsibilities. I think that’s a useful exercise in order to possibly break through the walls of the life we’re currently living and see the potential of what could be. 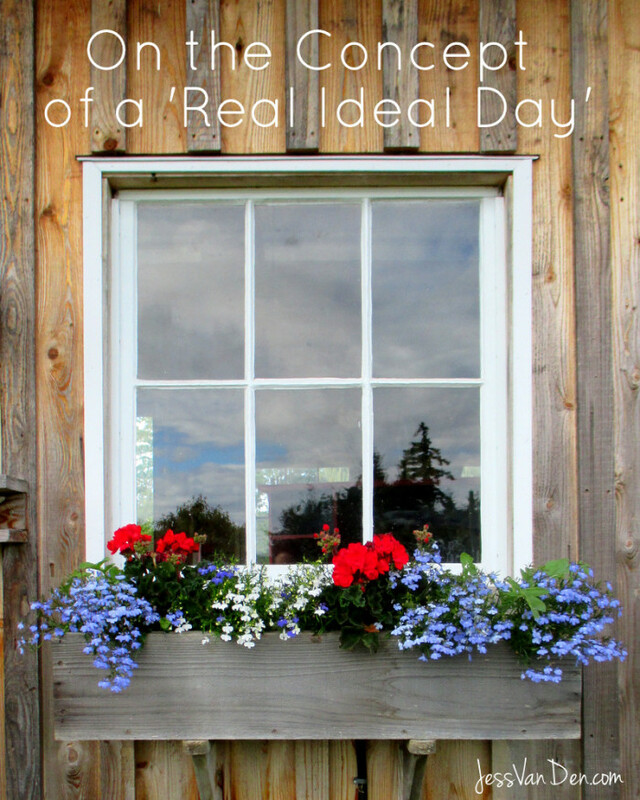 However, I think there’s also tremendous value in putting together what I call a ‘Real Ideal Day’. That is, an Ideal Day that you could actually have starting tomorrow, without making any major life changes. This is a powerful tool for living more consciously – because it helps you to find all the little spaces that you may be missing – and helps you to contemplate if you really want to be sitting down in front of the telly for 3 hours every night like you do now (although, if you’re here reading this, I’m going to hazard a guess that you’ve already broken free of that particular vice). I also find it helpful to focus on doing this exercise for a work-day, and leaving myself freedom on my days off – because I know that if I structure myself too strictly, my brain will rebel and it will all fall apart. This exercise makes you realise that in order to make time for the things you really want to do, you need to stop doing the mindless things you are currently doing. For example – I’ve been getting more interested in yoga, and have been doing a daily practice for a few weeks now. Most days. I’ve done it on and off for years, but due to a calf tear I sustained last year, I had to find alternative exercise to running, which lead me to get more deeply interested in yoga and strength training. I love yoga makes me feel, and I know I want to make it a daily habit into the future, so I need to carve out time to practice. What am I going to stop doing so I can start doing this new thing? For me, I have made the conscious choice to give up some of my relaxation reading time (novel reading) in order to replace it with yoga practice before bed. This is a difficult choice, because I ADORE reading. I could read novels all day every day if there wasn’t a need to do things like make a living and interact with other real human beings. I won’t go so far as to say it’s a sacrifice (I’m a big believer that we seriously over-use that word) but it is something I have to decide. Are the benefits of yoga more or less than the benefits of reading novels? These are the sorts of decisions that a Real Ideal Day exercise forces you to make. Just as an example, here is my current Real Ideal (Work)Day. 7am – Wake up, get up, grab a cup of coffee from my auto-brew coffee pot. Go back to bed and read non-fiction/blog posts for an hour while waking up. I recently bought all the books in both Toolkits for Life from The School of Life, so they will keep me busy for a while! 8am – Go for a 1/2 hour walk outside. This is my quiet time. I don’t listen to music, I just walk and think. Return. Do a vigorous yoga session. 9am – Sit down at the computer and write for an hour. This can be blog posts, courses, guides – whatever I need to work on that day. 10am – Get online and do some marketing. Social media scheduling, emails to my mailing lists, blog organisation and communication activities. 11:30 – HIIT bodyweight/strength workout followed by a shower. 12pm – Lunch + one episode of whatever series Nick and I are currently working our way through. 1pm – Jewellery making in 45/15 intervals (where 45 minutes is work, and 15 is break/social media etc). 6:30 – ‘Free time’ – hanging out with Nick, family, friends, going to classes, reading etc etc. When I’m in a busy period (e.g. launching a new product/larger than usual influx of orders), I will spend some of this time working. 9:30 – Relaxation yoga session + meditation. 10:15 – Go to bed and read fiction or listen to music. Aim to be asleep by 10:30/11 at the latest. You can see I like to work in hour blocks where possible, and I don’t like to be too prescriptive of exactly what I’m doing at any one moment. My inner freedom fighter wouldn’t allow it. While some of you might completely recoil at the thought of scheduling any of your time, I maintain that there is freedom inherent in the exercise. Real, conscious freedom. The freedom that comes when you know that you’re doing what you’re doing because you’ve actually thought about it and Past You has consciously, deliberately decided that this is what Present You needs to be doing right this moment. It’s also freedom from choice paralysis. Especially for those of you who – like me – are self-employed without a designated ‘place’ to go to work each day. Having to decide, each and every moment of each and every day, if you should be working or doing something else – or, if you should be working, exactly WHAT you should be working on – is exhausting. If you’ve never seen it, you should watch this fantastic classic TED Talk by Barry Schwartz: The Paradox of Choice. He discusses the fact that the more choice you have, the unhappier you are, because no matter what you choose, you know that there are x number of other choices that you could have made – so you are more likely to see the negatives of the choice you have made. The old ‘grass is greener on the other side’ dilemma, writ large. Doing a Real Ideal Day exercise helps to free you from choice paralysis, because when you’re actually spending your day in accord with your Ideal plan, your conscious self and your present self are in alignment, which means a sense of calm and achievement. You know you’re doing what you know you really want to be doing. (Say that five times fast, I dare ya). So, if you’re spending your days haphazardly, and coming to the end of the day only to wonder ‘what did I actually DO today?’ I urge you to give this exercise a try. Not as a purely academic exercise you do and put aside, but as a practical, realistic guide to help you structure each Real Day in your life. I love the ideal day exercise and have used it loads over the years since I first learnt it from Miss Tara G! And I think you spot on that getting closer to it is about living consciously and making clear choices about how you want to spend your time.